When it comes to HIV many people bury their heads in the sand. Don’t be one of them. Whether you are at risk for HIVm already living with HIVm or simply don’t know, we invite you to attend this confidential, prejudice-free meeting, where you can speak with a seasoned medical expert and get all your questions answered. Bring a friend! For your attendance, you will receive: a gift card, food, educational tools. To RSVP, please contact Angela Hursey at 337.439.5861 or email angelah@slac.org. Begun in 1999, it is a day that promotes education, awareness, testing, treatment, involvement, prevention strategies, and more amongst black communities. This year commemorates 20 years of NBHAAD. Free and Confidential testing is available 2/7/19 from 10am - 6pm at 425 Kingsley St. and 8am - 3:30pm at 808 Walters St. in Lake Charles. SLAC, in partnership with Warren United Church, invites you to join us in recognition of World AIDS Day 2018. Please join us for: THE STORY OF US - A Message in the Music. See above for day and time. World AIDS Day is held on December 1st of each year and is an opportunity for people worldwide to unite in the fight against HIV, show their support for the millions of people around the world living with HIV, and to commemorate people who have died. Wearing a red ribbon is one simple way to do this. For more information on World AIDS Day, please click here or you can visit the World AIDS Day website. Order a pizza at Pizza Artista in the Prien Lake Mall on October 17, and Pizza Artista will donate 20% to SLAC. Remember, you MUST mention SLAC during checkout for SLAC to receive the donation. World AIDS Day was the first ever global health day, held for the first time in 1988, dedicated to raising awareness of the AIDS pandemic caused by the spread of HIV. Government and health officials, non-profit organizations and individuals universally observe the day, often with education on HIV prevention and control. Presented Reliant Healthcare Specialty Pharmacy. Lunch is provided. All PEI seminars begin at 12pm (noon) at the RWC. Lunch is provided. Patients and caregivers are invited to attend. Call Venard, MSW, for information and dates/times. SLAC, in partnership with Warren United Church, invites you to join us in recognition of World AIDS Day 2016. Guest speakers: Robert Suttle (Assist. Director of Sero) and Nomica Guillory. A night of comedy. Featuring Ms. Cocoa Brown, Jeff DeRouen, and local comedians. Ms. Brown is an actress who has appeared both on Tyler Perry’s Single Mom’s Club and For Better or Worse. Tickets: $25 - Civic Center Box Office or at the door. Lake City Improv is presented by SLAC, in an effort to support its innovative programs and generate greater community awareness for HIV/AIDS. • More event and ticket information forthcoming. L’Auberge Casino Resort Lake Charles. The state of Louisiana&apos;s STD/HIV Program Office is conducting a client satisfaction survey for all Ryan White Part B agencies (including SLAC). There are two ways of completing this survey, which impacts funding for services such as case management, food pantry, medical transportation, and dental care. One way is to come into the SLAC office and ask for a survey; the other is to complete a survey online at https://www.surveymonkey.com/r/RWptB_CSS2016. Deadline for completing surveys is April 15th. The Louisiana AIDS Advocacy Network (LAAN) is hosting its annual Legislative Awareness Day on Tuesday, March 29th, in Baton Rouge. 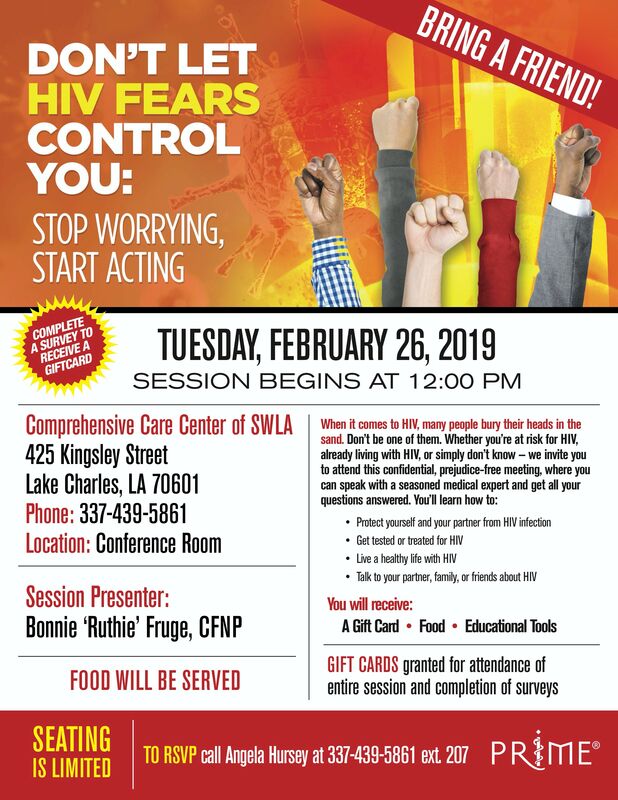 The day will include information about living with HIV in Louisiana, advocacy training, and the opportunity to talk with state legislators about issues of interest to persons living with HIV. You can register at http://goo.gl/forms/RIUbFklvjf or by calling Darlene at (337) 351-5341. Bus transportation from Lake Charles will be available if we get enough registrations. Santa, Santa, please stop here! To fill our Christmas with joy and cheer! SLAC will be giving away toys for the children of clients on Friday, December 16 from 9am until 12pm. Come by the office and pick up something for your little one.